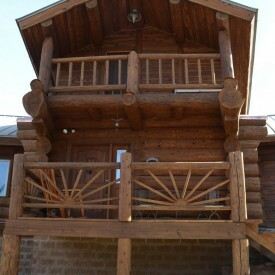 Owning a log home or log cabin is a major investment and log home care is different that caring for other typical homes. If you want your log home treated properly, then call 888-LOG-GUYS! For over 15 years, we have been in the log home restoration business, and we have the expertise and experience to give your log home what it needs! 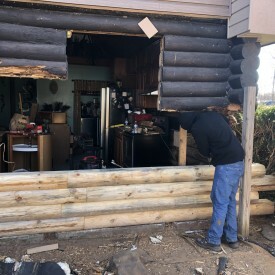 We also know how to repair or replace logs, apply chinking or caulking (energy seal), construct significant additions for improving your log home, and maintain log homes. Let us show you what professional work REALLY looks like for log home care! 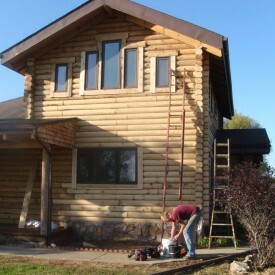 We are the best in the nation when it comes to log home restoration! We use quality products to refinish your log home, and you log home will look like it was never dull, gray, or weathered before. Our restoration process includes media blasting (glass, sand, corn cob, or walnut blasting) the old stain, sanding the logs, cleaning the logs with a borate treatment, applying energy seal (chinking or caulking), and staining. Ask for a free estimate online or give us a call, and let us show you how we can make your log home in the Hopkinsville KY area as good as new! If you have found log rot, damage caused by bugs, or holes pecked by birds in your logs, there is no need to worry! Our crew at 888-LOG-GUYS has a great deal of experience repairing or replacing logs that need attention. 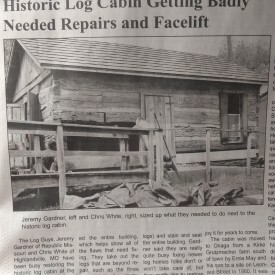 We can fix your log home that has minor flaws to severe damage! Please don’t delay! 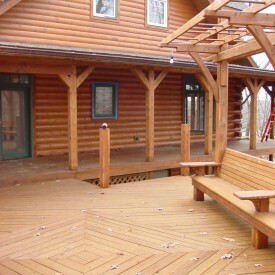 Contact us today for the solution that you need to fix your log home or log cabin! Call our number or request an estimate from our website! The white line in between your logs is not just for decoration and it has a very important purpose. That white stuff fills in the gaps between your logs, places where things (such as insects, air drafts, and water) that you want to stay outside can come in. Keep pesky bugs away, air drafts at bay, and water leaks out of your log home! Let 888-LOG-GUYS apply an energy seal or repair your old chinking or caulking to ensure your home is a cozy and comfortable place. Just give us a call, or you can ask for an estimate online! 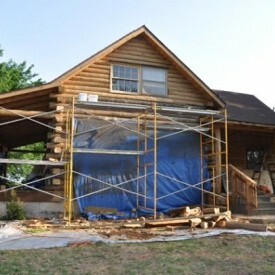 We don’t just complete log home restoration or log home repairs. We can even build that log staircase or log railing you have been thinking of. Or is it a new deck, porch, or patio that you have been dreaming about? We can construct those things, too! Ask 888-LOG-GUYS to improve your home the way YOU envision it! You can ask for a free estimate from our website or call or number for more information! We want to serve you and make your log home in the Hopkinsville Kentucky area even better! We know how important it is to preserve your log home or log cabin and keep it in excellent condition. Our company knows how to maintain your log home so that you don’t have to worry about restoring it all over again. The 888-LOG-GUYS staff will to keep track of when your home is due to be cleaned. You don’t have to even think about it anymore! 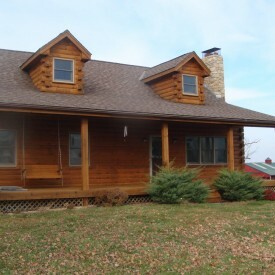 Let us take care of your log home in the Hopkinsville KY area while you sit back and relax!